The drive up to War Eagle is not one you take quickly. No matter where you come from, you end up on windy, scenic, two-lane roads with miles of sky and fields aplenty. Approaching from the south, you round a bend, and suddenly, you’re glancing out over a verdant plain below, green dotted with the red of farm buildings and the far-off site of a three-story structure. That is your destination. You snake down the side of the hill, roll out into a field and wonder at the sign that states, “War Eagle Craft Mill, next 10 exits.” Exits? You’re in a cow field, for heaven’s sake! Roll right with the road, down past a couple barn-type buildings on the right and a couple houses on the left, and then, you’re at the bridge. security of the gravel. You have arrived at War Eagle Mill. The big gravel lot to the right is usually dotted with cars and motorcycles, sometimes with people just getting out of their vehicles, stretching their legs and visiting the facilities on the far side of the lot. Sometimes, there will be children there with handfuls of corn from the converted candy machine, toddling after the ducks and geese that tend to wander up from the river below. 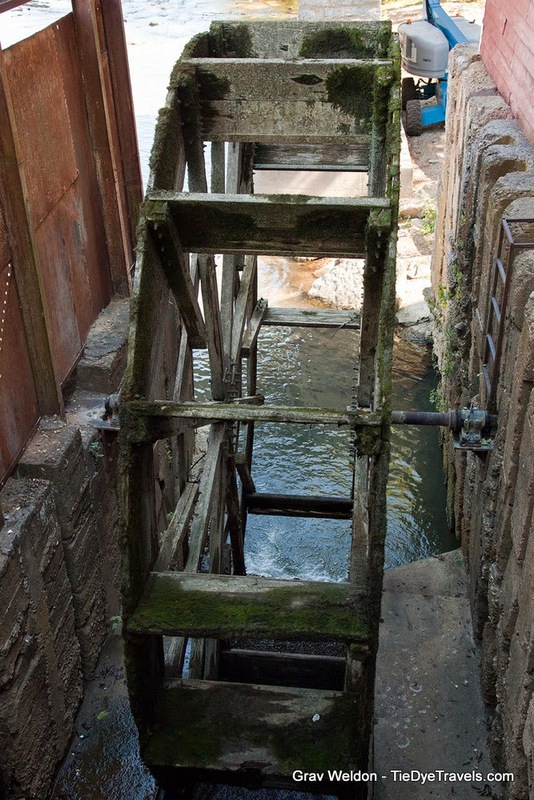 Sometimes, there’s just the hum of the afternoon and the swish of the waterwheel. Up the stairs and past the “No Wet Feet” sign, you enter the mill and are greeted with the ever-present churning and grinding of the millstone and machinery. Sometimes, one of the folks working back in the rear will pour in whole grains to be busted apart by the stones. Or there will be a couple people asking questions about the mill’s operation. It always seems to smell good. and all sorts of mixes, as well as oven mitts and trivets and even fresh-baked bread in tiny loaves to snack on, if you’re hankering for something to take with you. And there’s that smell—not just of the grains but of something else, something from the oven—that draws you upward. 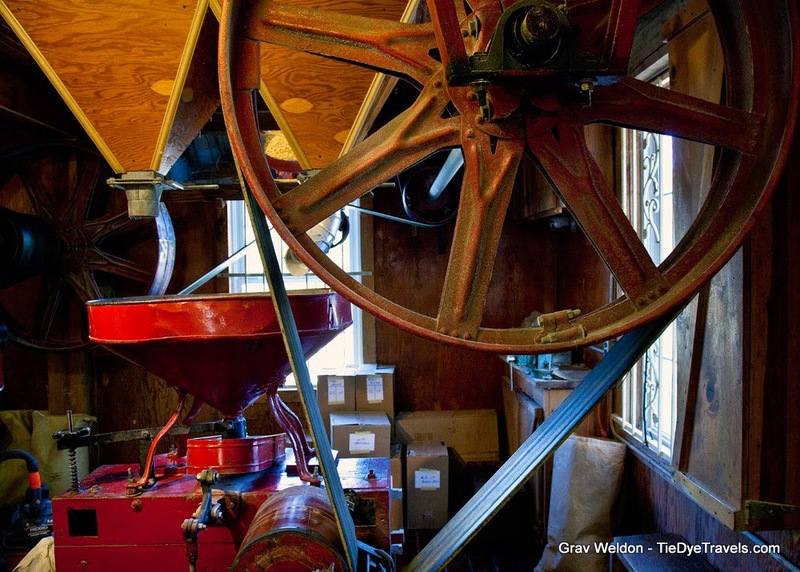 are tacked on angled ceilings and walls, bits of a past that’s embraced and treasured by those who work here and those who choose to make the trek, over and over again, to visit Arkansas’s only working undershot wheel gristmill. For generations, the power of the War Eagle River has been harnessed to mill grain for the Ozarks. Farmers would bring bags and bushels of corn and wheat from their fields to the mill to have the grain ground for their bread and sustenance. 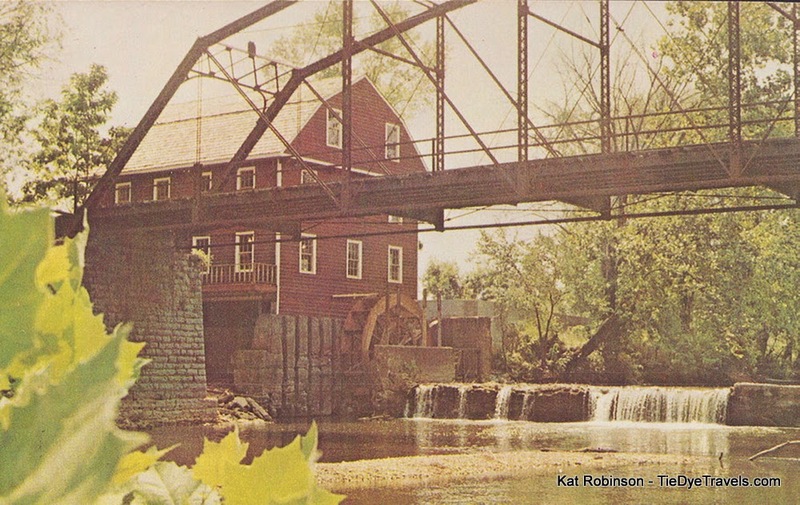 The mill’s history spans back to 1832, when the first mill and dam were built by Sylvanus and Catherine Blackburn. The first mill washed away in a flood in 1848. The second, built on the foundation of the first, became the heart of a community with an attached sawmill and a blacksmith shop, church and school all on the same property. It was destroyed by Confederate troops, burned to the ground three days before the Battle of Pea Ridge in 1862. Sylvanus’s son, James, built the third mill in 1873, but instead of using water power as his father had in the previous two mills, he used a steam-powered turbine to operate the machinery. It burned in 1924, and the foundation sat barren for nearly fifty years. A man name Jewell Medlin and his wife purchased a cabin on top of a hill that included the mill foundation in the deed. 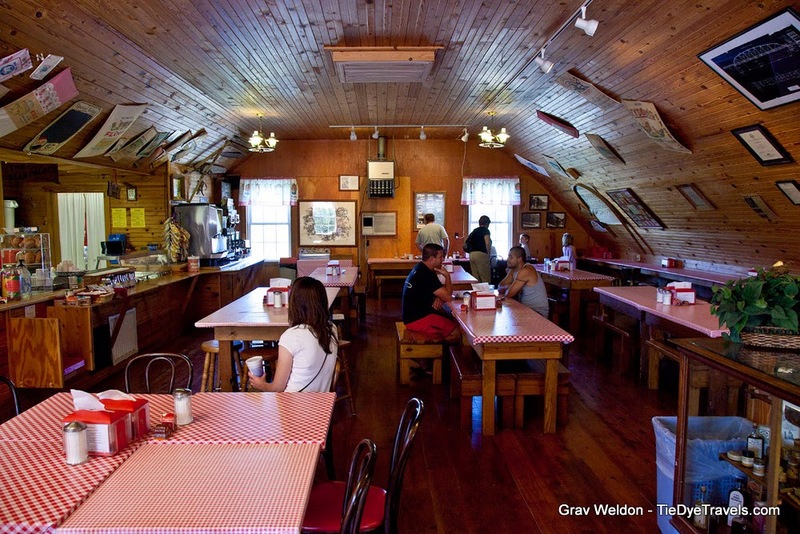 Jewell contacted his daughter, Zoe, and asked if she would be interested in running a gristmill. They successfully reopened the War Eagle Mill on the same foundation in 1973, one hundred years after the opening of the third mill. This fourth mill is powered by an undershot wheel, the only such device operating in all of Arkansas. Zoe and the man who would become her husband, Charlie Caywood, ran the mill for thirty years. 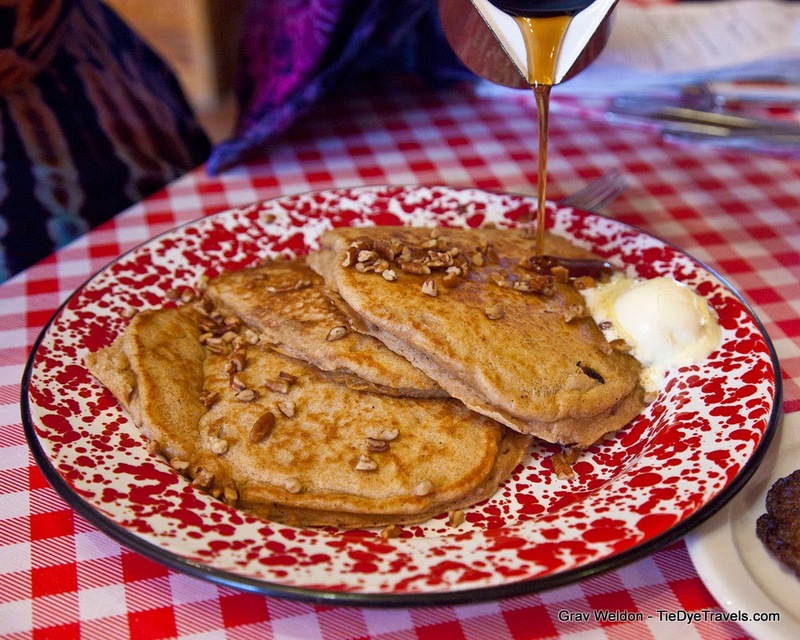 They sold it in 2004 to Marty and Elise Roenigk of Eureka Springs, the owners of the Crescent and Basin Park Hotels. Today, Elise is the sole owner, Marty having been the victim of a car accident in June 2009.
weekend through the dormant winter months. Then there are the fairs. Every May and October, these massive events take over the landscape and bring thousands to the area, ninety thousand in the spring and over a quarter million in the fall. 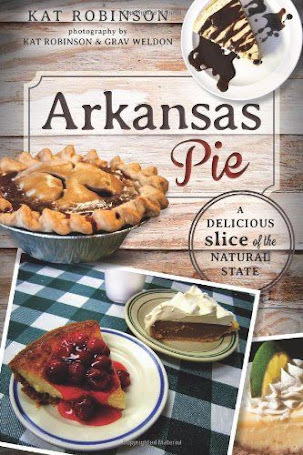 For a few days each year, War Eagle becomes the biggest town in Arkansas (yes, even bigger than Little Rock) with vendors, live entertainment and arts and crafts. It’s hard to imagine—looking out from the window on the third floor of the mill and savoring a cornbread sandwich—the pastoral landscape beyond the river, green and quiet. 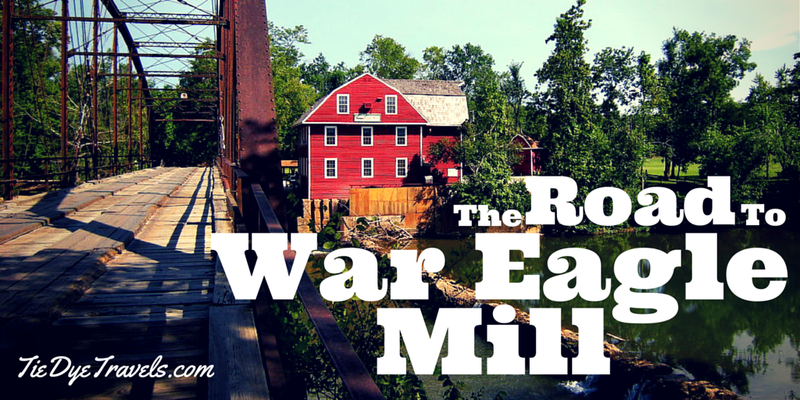 War Eagle Mill isn't just a quiet three-story gristmill any more. 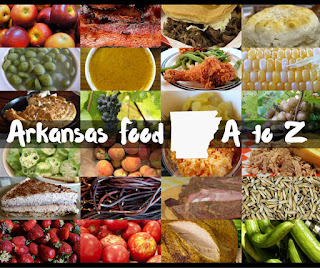 It’s big business, with a website drawing in folks to order products and a bustling retail business with flours and meals placed in stores all over Arkansas and the surrounding states. 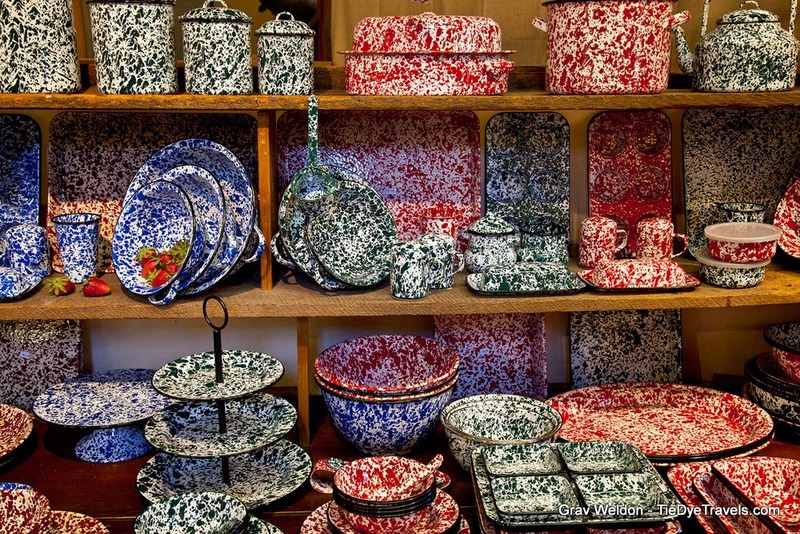 Still, much of the sales come from folks who make the pilgrimage from Rogers or Harrison or Eureka Springs and load up on the bags of flours and jars of jam and preserves. There’s been some small controversy with fans over the recent move to paper bags from the traditional cloth sacks replaced at the beginning of 2013, but the reasoning comes from the fact that most folks aren't making garments out of flour sacks any more. swaddled in that fantastic air of history. War Eagle Mill is open every day through January 2nd, when the big three story red building on the War Eagle River will close for its annual cleaning. Even if you can't go before then, you can still order wareaglemill.com. 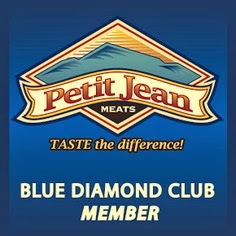 And you can try all sorts of great recipes here. 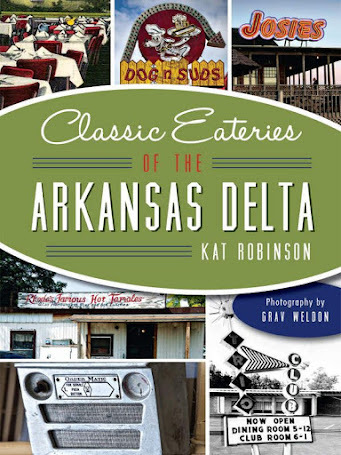 Want to learn more about classic restaurants near and around War Eagle Mill? 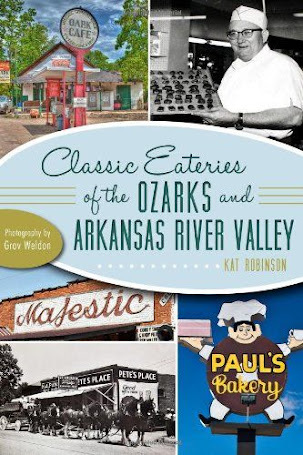 Check out Classic Eateries of the Ozarks and Arkansas River Valley. Beans and cornbread was one of my favorite meals before going grain-free. A cornbread sandwich sounds yummy. Their corn meal is my favorite. It's chewy and gives a little bit to your corn bread. Not like the corn powder you find in the store.